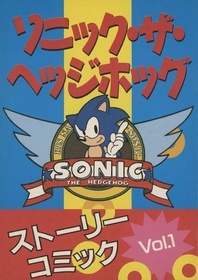 Sonic the Hedgehog Story Comic (ソニック・ザ・ヘッジホッグ ストーリーコミック) is a three-volume promotional comic for Sonic the Hedgehog distributed alongside the Japanese magazine Mega Drive Fan. The comic tells the story of the first game, with Sonic traversing across South Island and rescuing his animal friends from Dr. Eggman. As the comic was created before the final release of the game, there is a number of references to old concepts and prototype material. Sonic is the lead singer of a band, travels through Sparkling Zone and Clockwork Zone, and the final issue details how Sonic became the mascot of a deceased pilot. The three volumes are thought to have been released alongside Mega Drive Fan in June, July and August of 1991, though a subsequent re-release of the trilogy was also distributed around this period for non-readers of the magazine. This page was last edited on 23 March 2019, at 13:51.